Meerkats are a cooperatively breeding species, with a dominant breeding pair and up to 40 'helpers' of both sexes who do not normally breed but instead assist with a number of cooperative activities such as babysitting and feeding of offspring. However, scientists have questioned whether sentinel behaviour, when helper meerkats climb to a high point to scan for predators, and other vigilance behaviour, such as standing on their hind legs, is done for their own preservation (with the group's increased safety being an indirect consequence) or if the primary goal is altruistic, with the main purpose being the protection of the group. Peter Santema, a PhD student at the University of Cambridge's Department of Zoology, said: "You see similar behaviour in a range of mammal and bird species, and we know from previous work that other group members are less likely to be attacked by predators when someone is on guard. Biologists have been debating, however, whether the protection that other group members enjoy is just a side-effect or one of the reasons why individuals perform these guarding behaviours." For the research, which was funded by the BBSRC, scientists observed non-breeding helpers in the period just before the dominant female's pups had joined the group on foraging trips. They repeated the observations immediately after the pups joined the group. When they compared the results, they found that after the pups had joined the group on foraging trips, helpers showed a sudden increase in their vigilance behaviour. Santema added: "These results are exciting, as they show us that individuals are not just on the look-out for their own safety, but that the protection of other group members is another motivation for these behaviours. Our results thus suggest that vigilance and sentinel behaviour in meerkats represent forms of cooperation." More information: The paper 'Meerkat helpers increase sentinel behaviour and bipedal vigilance in the presence of pups' will be published in the 05 February 2013 edition of Animal Behaviour. Not necessarily. 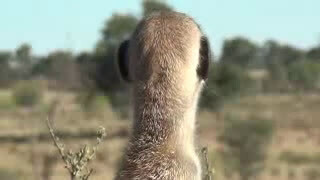 Predators will variably focus upon meerkats vs other prey depending upon success in catching them. Since meerkat pups are easy to catch, its in an individual meerkat's selfish interests to stop potential predators catching them and shifting their focus in the future upon meerkats rather than other prey. No meerkat wants a predator hanging around because it tasted a young meerkat--it--however old--could be next on its menu.